This Bookreporter.com Special Newsletter spotlights a book that we know people will be talking about this spring. 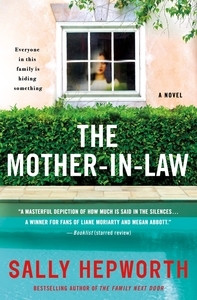 Read more about it, and enter our Spring Preview Contest by Wednesday, April 24th at 11:59am ET for a chance to win one of five copies of THE MOTHER-IN-LAW by Sally Hepworth, which is now available and will be a Bookreporter.com Bets On title. Please note that each contest is only open for 24 hours, so you will need to act quickly! From the moment Lucy met her husband’s mother, she knew she wasn’t the wife Diana had envisioned for her perfect son. Exquisitely polite, friendly and always generous, Diana nonetheless kept Lucy at arm’s length despite her desperate attempts to win her over. And as a pillar in the community, an advocate for female refugees, and a woman happily married for decades, no one had a bad word to say about Diana…except Lucy. Who could possibly want Diana dead? Why was her will changed at the 11th hour to disinherit both of her children and their spouses? And what does it mean that Lucy isn’t exactly sad she’s gone? THE MOTHER-IN-LAW will be a Bookreporter.com Bets On pick. Don't miss Carol Fitzgerald's commentary in the May 3rd Bookreporter.com Weekly Update newsletter. - Click here to visit Sally Hepworth's website. - Connect with Sally Hepworth on Facebook, Twitter and Instagram. This is a special newsletter for our Spring Preview Contests, which will mail on select days through April 24th. This newsletter is separate from our weekly Bookreporter.com newsletter, which mails every Friday. You can subscribe to that newsletter here.